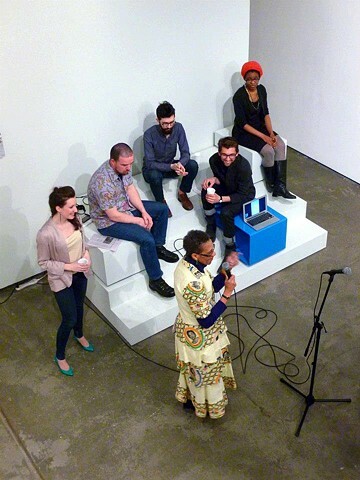 Curating > "Cultural Fluency: Engagements with Contemporary Brooklyn" - BRIC, Brooklyn NY. Using karaoke style comedy routines, viewers reflected on American's predictions, perceptions, hopes, and fears of having its first black president. Watch the performance here. In this "do-it-yourself" public intervention, viewers explored the extent to which Obama's election has subtly shifted non-black Americans' perceptions of Afro-American women, by creating a nation of people who feel a personal connection to his wife, Michelle.